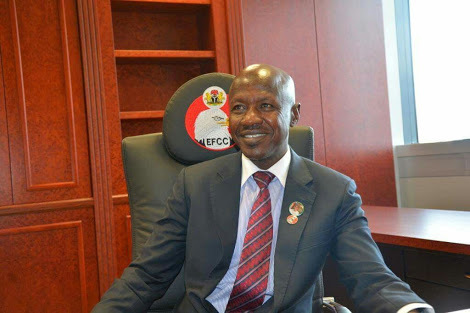 The acting Chairman of the Economic and Financial Crimes Commission, Ibrahim Magu, on Monday refuses to answer questions on whether the Kano State Governor, Abdullahi Ganduje, was under probe over the widely circulated Dollar-bribe videos. The acting EFCC manager had reeled out the accomplishments of the anti-graft agency in the last three years including a large number of convictions and recoveries. He ignored it and simply said, "Next question please." Funny enoug, Prof. Itse Sagay (SAN), had said the Kano Assembly was not competent to probe the governor, adding that only an anti-graft agency like the EFCC could do so. But now the EFCC is dodging the issue.